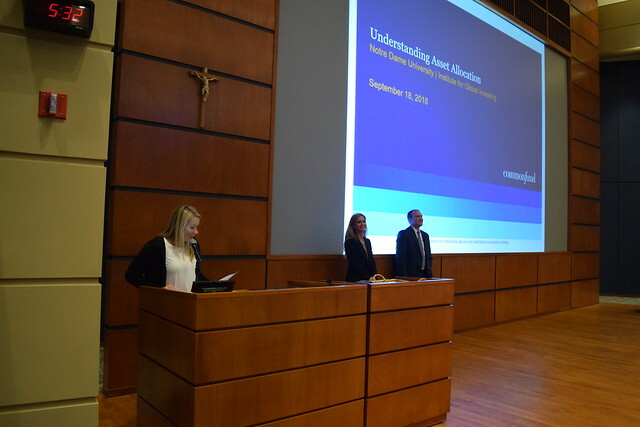 On Sept. 18th, Brian Cohen and Meredith Messina of Commonfund hosted “Understanding Asset Allocation.” The event was the second in this semester’s Robert K. Wilmouth Speaker Series, a number of lectures hosted by NDIGI designed to further students’ knowledge of the science and art of investing. The objective of the event was to explain to students the principles of asset allocation and how to apply those principles to both individual and institution portfolios. Brian Cohen has been with Commonfund for over ten years. He currently serves as a Director for the asset management firm. His primary responsibilities include asset allocation recommendations, portfolio oversight and analysis and tactical rebalancing. Prior to his current role, Brian was an Assistant Director, where he was responsible for asset allocation recommendations, portfolio oversight and analysis, and investment policy implementation. Cohen received his B.S. in Business Administration and Management from Bentley University in 2007 before earning his M.B.A. in Finance from Fordham’s Gabelli School of Business. Meredith Messina serves as an Associate Director at Commonfund. She is responsible for investor relations and client communications for Commonfund's advisory clients. Prior to her current role, she was a Managing Associate on the Business Development and Management Relationship Teams responsible for client communications. She began her career as a Client Service Associate at UBS Financial Services in Boston. Messina received a B.S. in Finance from Bentley University in 2006. Cohen and Messina began their lecture by talking about asset management firm Commonfund. The firm was founded in 1971 with a two-part mission. First, to create investment solutions and access to managers and strategies for nonprofits that could not attain them on their own. As importantly, the firm seeks to also create educational programs that could bring current best practices to institutional investors of all sizes and segments. The mission of Commonfund, said Cohen is “to enhance the financial resources and improve the investment management practices of our clients.” Commonfund has offices in Connecticut, New York, London, San Francisco, and Beijing. The firm has $25.3 billion in assets under management. Cohen explained that there are two main spheres in which the principles of asset allocation are applied. An individual has specific needs when seeking to diversify their portfolio, and those needs are dependent upon that person’s position in the workforce. A younger person, said Cohen, has a very long time horizon and would likely seek capital appreciation as their main goal. Conversely, a person exiting the workforce is more vulnerable to short-term losses and instead must protect their principal. Commonfund, however, provides its services to nonprofit institutions. Cohen gave the example of the University of Notre Dame’s endowment. With total assets of $11.8 billion, the University’s objective is to “maintain and grow the real value of the portfolio.” The key word in that objective, said Cohen, is “real.” Real value takes into account inflation. Because Notre Dame’s time horizon is perpetuity, it is particularly vulnerable to inflation. Cohen emphasized that real value is “very important and how you protect against eroding your portfolio.” To obtain this investment objective, Commonfund would focus on the fundamentals of asset allocation, which Cohen explained in the next section of his presentation. Capital stewardship, especially for a large institution, is a great responsibility. Perhaps the most important way an asset allocator seeks to create a better portfolio is through diversification, and through attempting to limit equity bias. Equity bias refers to the tendency of investors to invest in one type of equity, or only in domestic equities, while eschewing foreign equities. Cohen and Messina explained that a diversified portfolio––that is, one that is made up of a variety of investments across a variety of asset classes––is exceedingly more likely to outperform the market. Messina went on to discuss governing documents. A governing document, or investment policy statement (ISP), is an essential part of asset allocation. It is an agreement between the investor and their asset manager concerning return targets, permitted and prohibited investment strategies, and attitudes toward impact investing. “ISPs,” said Messina, “are living, breathing documents that every institution abides by.” An investment management firm such as Commonfund must abide by this document as well. Cohen and Messina concluded their lecture with an interactive case study, a hypothetical example of a university endowment. This university’s portfolio value was $50,000,000. Its investment time horizon was perpetuity. The governing document clarified certain risk assumptions and stated there is an expected average annual return of 5.9%. Though one may be tempted to answer affirmatively because of the portfolio’s construction, the answer is no. This is because the net return assumption is lower than the expected average annual return of 5.9%. To learn more about Commonfund and asset allocation, visit their website here.